Just made some DIY gifts for realtors that we are hoping to do business with. I was inspired by St. Patrick’s Day and of course our Madison Modern Home green! 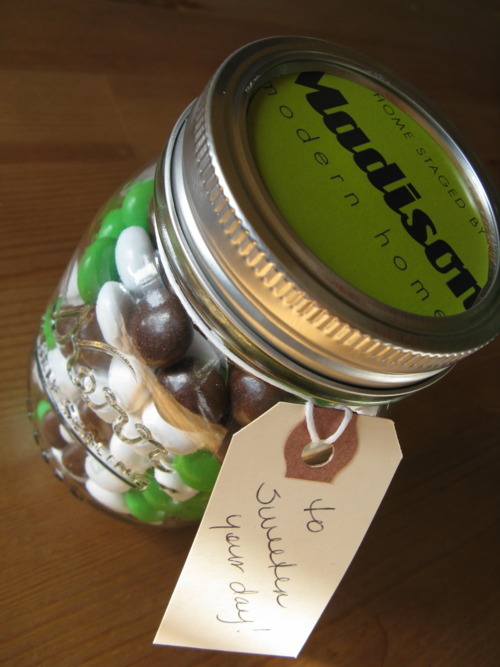 I found Mason jars at Michael’s for $1.25 each and filled them with the new coconut M&Ms (yummm!) in green, white and brown. Then I put a business card inside, cut out a piece of paper with our logo for the top of the jar, and tied it all up with a manila shipping tag which I found at Staples. I can either personalize the tags or write a basic message like I did here.